What is a Rollator? 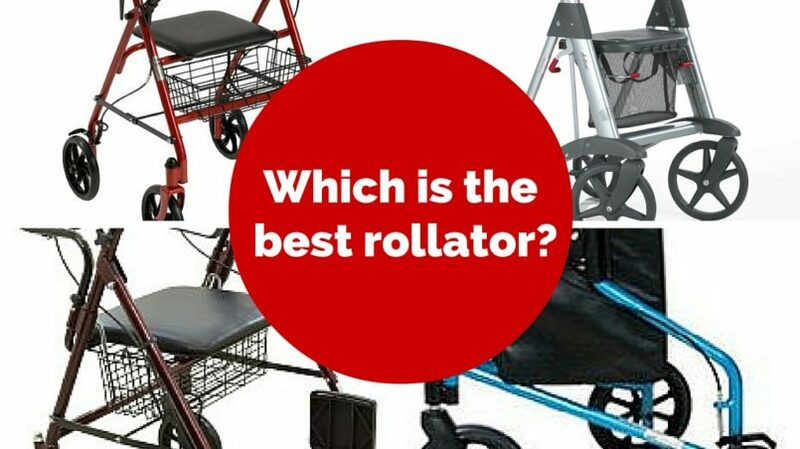 | Which is the Best Rollator With a Seat? Rollators are simply a walker with 3 or 4 wheels. They are also commonly referred to as a rolling walking or wheeled walkers. A standard Walker can be slow and difficult to use for people with little strength or endurance. Rollators make getting around much easier by having a wheel at the base of each leg. This means that they are much more mobile as they can be pushed ahead instead of having to be lifted and placed with each step. There are two different types available: 3 wheel and 4 wheel. They also often come with seats, baskets, pockets and other features to accommodate day-to-day activities that someone might do while they are out and about. Why Buy a Rollator walker? What Makes a Good Rollator? Rollator Weight – just because it is on wheels doesn’t mean that every model is easy to use for every owner. Light-weight models can increase the time you can remain on your feet and moving and decrease your recovery time. Knowing your models’s weight can help you decide if it will be the right fit for you. Your Weight – You need to know the weight capacity of your model. There’s not much use buying one that can’t hold your weight. Rollator Width – If you need to use a one to move about in your house, then the width of your model is very important. A standard bathroom doorway is only 22” wide and most models are wider than this. Seat or no seat – If you want to have a seat then you can eliminate 3 wheeled options. These models do not come with a seat option. 3 or 4 wheel – Three wheel models are easier to navigate in smaller areas, are lighter, but don’t come with a seat. Four wheel models are also more stable. Handle height – To get the right handle height, put your walking shoes on and stand up straight. Put your arms down along your side then measure from the floor to crease in our wrist. This should give you a comfortable grip on your handle bars. Chair height – You can simply choose a chair in your home that you have an easy time getting in and out of and measure its height. Chair width – If there are any small spaces in your home or somewhere that you frequent you should measure the width to make sure your mobility aid will easily fit. Comfy seat – taking a break on a padded seat is heavenly. When you’re tired, who wants to sit on a hard plastic chair? Large wheels – If you walk over any uneven ground or sidewalks you will have trouble if the wheels are too small. A large wheel (anything over 8”) is perfect for traversing bumpy trails or pathways. Adjustable height – You want one that you can adjust to suit your needs. If you ever need to lower or raise it, it is nice to have some room to work with. Foldable – If you want to fit it in a vehicle or in a tight closet, it is important that it can fold up. Shop around. Make sure you are well informed and are getting what you want in a rollator before you make a purchase. Consistently, the most raved about 3 wheeled rollator walker is the GF 3 Wheel Cruiser. It has a lot of thoughtful features like ergonomic handles, light aluminum frame, adjustable handle height, large 8” wheels, and a large zippered pouch. 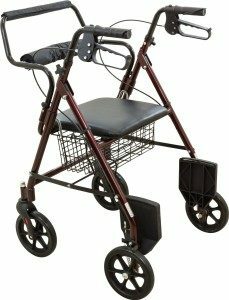 For more information about 3 wheeled walkers or to view other models we recommend please click here. Click here for the best price on the GF 3 Wheel Cruiser. Our favorite 4 wheel rollator walker is made by Drive Medical. It is a very inexpensive, durable steel framed mobility aid with adjustable handles and carrying basket. With 7.5” wheels it is great for indoor and outdoor use and has a nice padded seat and back rest for when you need to take a break. 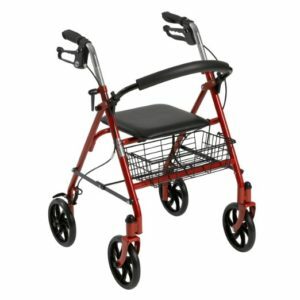 For more information about 4 wheeled walkers or to view other models we recommend please click here. 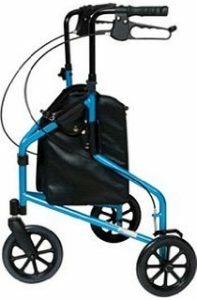 Click here for the best price on the Drive Medical 4 Wheel rollator. Purchasing any mobility aid for use inside your home can be difficult. Most homes have narrow hallways and door frames can be small in places like the bathroom. It is best for indoor models need to be narrow, light and easy to navigate. Having some storage compartments is also another appreciated accessory. Three wheeled walkers are particularly useful indoors as they are easier to steer and usually fold up nicely. Transport chairs are a bit different than rollators. A transport chair is a rollator that has the added functionality of a lightweight wheelchair. These chairs can be quickly modified from a standard rollator to a wheelchair, which is nice when are on long outings or when you need a rest and have someone along who can keep you moving. They are a bit more expensive than a rollator, but are well worth it when you are out with your extended family or friends and need a break. There is nothing worse than pushing yourself too far when you feel like you are holding up the group. One other nice feature of a transport chair is that they are very portable. They usually fold up very nicely and are much nicer for travel than a wheelchair or regular rollator. They are also nice if you have been recently injured and want to get around a bit on your own to build up strength, but also need to rest so you don’t overdo it. Pushing your mobility device around until you are ready for a break is a great way to safely build up your stamina and strength. Overall, transport sales are very handy for those who want to travel further and longer. There are quite a few transport chairs out there, however the one we have found that patients have consistently liked the most is the Roscoe Medical 30192 Transport Rollator. It is inexpensive, has large wheels which are great for use in or outdoors and provides an easy and smooth ride. The one drawback of this model is that its weight capacity is 250 pounds. Other than that, this unit is an excellent all-round choice.